Nokia has added Toyota to the list of customers of its new Here navigation platform. If all goes according the plan, Nokia Here will be integrated in Toyota models starting in early 2014. The system will be used Europe, Russia and the Middle East. Nokia's Here will be used to provide drivers with many features, including mapping solutions, a library of various content like user reviews of certain places of interest, as well as images. Introduced in mid-November of last year, Nokia Here is a multi-platform mapping software that provides various mapping services. Some of the plans for its future development include the addition of new features such as 3D maps. You can learn more about Nokia Here... here. Toyota makes cars just as good if not better than honda. 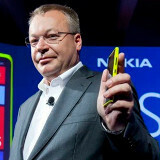 Elop's brain is working much faster then ever..... :) Good news for Nokia..
Zipperboy, you're as bad as myz and gallito. It is OK to admit other products have good features, in this case Nokia (namely its subsidiary Navteq) having the best non-military maps in the world. Google's good, and has a few good and unique features, but it is not the "best", and I'm not sure it ever has been (except possibly for desktop usage before Navteq's info was available online). Most of the major GPS makers, whose sole function is navigation, use Navteq; what does that say? Not angry just better informed than boy. So d**kwyn gets a thumbs down, but tiara6918 gets thumbs up. Strange? Anyway, Ellops brain had to work fast since he started and is doing a great job. Just don't appreciate when he gets lippy about other companies. This proves again that Nokia maps are the best! Not like crappy ios maps or google maps! I always use here.net but some rural areas do need upgrading.. If Google can, Nokia can too..